“DENIQUE COELEM” is the family motto of the Melvilles of Ellinghurst. Translated it means ‘heaven at last’. 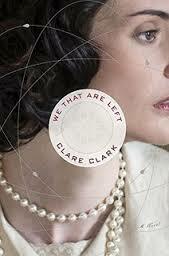 Ellinghurst serves as the backdrop of Clare Clark’s period novel We That Are Left. With its sprawling lawns and gothic architecture, it symbolises the epitome of English aristocracy- the lifestyle, the glamour, the challenges and the failures. Centuries of history resides at Ellinghurst and adding to it, in early 1900s, are the young Melvilles – Theo, Phyllis and Jessica. Their family is dysfunctional but tradition keeps them bound together in their privileged world. Oskar Grunewald is not a Melville, but Ellinghurst is a part of his and his mother’s lives. A frequent visitor, Oskar is fascinated by the house, especially the enormous library. Ignored by the other children, he spends all his time lost in books, finding companionship in numbers and the infinite laws of physics. Oblivious to how their destinies are entwines and how Ellinghurst will change their lives, the children all go their separate ways- Theo to the battlefront in France, Phyllis to excavate tombs in Egypt, Jessica to the glitzy London life and Oskar to Cambridge, to pursue his scientific dreams. Theo Melville is killed in the Great War, demolishing the lives of the family left behind. The war changes everything and while the world around the Melvilles takes on a new and modern perspective, the family at Ellinghurst stays caught up in their loss, their ideals and their pursuit for happiness in their shattered world. Left alone in the world, after his mother’s death, Oskar too tries to make semblance of his life. Clare’s narrative is deeply moving. Her figurative prose and masterful descriptions make this saga come to life. Every character reaches out and connects with the reader. The novel is well researched and paints a vivid picture transporting the reader back in time. While the story of Phyllis brings to light the great archaeological efforts of Egyptologist Howard Carter, Oskar’s narrative reverberates with the theories of Albert Einstein and Ernest Rutherford. Caught up with the changes around her, Jessica’s story is synonymous with that of many young girls, who first tasted freedom after the success of The Suffrage Movement in the 1920s. The plot thickens as the pages turn, making it difficult to put the book down. Very deftly, Clare manages to incorporate the scientific theories and political events from that period into the stories of the main characters. Their personal journeys are enthralling and heart wrenching. One gets so engrossed in the lives of Oskar and the Melvilles, that even when the book finishes, it is difficult to stop thinking about them. Ellinghurst continues to haunt!!!!! This entry was posted on November 1, 2015 by artikabakshi in Book Reviews, Fiction, Historical and tagged Clare Clark, We That Are Left.